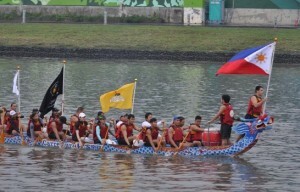 By winning 5 golds and 2 silvers in a world-championship event held at Tampa, Florida, our dragon boat team won the hearts of Filipinos, especially the Fil-Ams based there who went out in full support of the team. They're the world champions in their events and even their American and other opponents from several countries were all praises for them. T'was one of those rare moments in international sporting events where our national anthem was played during the medal awarding. Their accomplishment was a Philippine victory; and we hailed them heroes. Victory? Heroes? Not quite,according to our sports officials from the POC (Phil. Olympic Committee) and the PSC (Philippine Sports Commission). And this the tragedy of it all. Here you have two agencies in charge of sports development in the Philippines belittling the team and their achievements to justify their not giving financial support and non recognition. To rub salt to injury, news reports today say, they go to the extent of hurling malicious charges and insults to the members of the team; saying, "they are already too old for the sport, that they falsify their time trials, that they are taking steroids". What a disgraceful statement. They could not give financial support for reasons of their own but yet can afford to throw in these malicious statements. And they are supposed to be the honorable men tasked to develop, promote, enhance, etc our country's sports. And we're not even mentioning here their capabilities. Consider this. On the age issue. I think it's a case of "look who's talking?" These officials have been here for as long as i can remember; and look how old they really are. They are as if officers for life in the the POC and PSC. Case in point. We have the wrestler Baylon who the last time I read was already nearing 50's, yet still actively competing and winning honors for the country in the SEA(Southeast Asian Games).He has been competing since the 70's. Will you take issue with that? an "old" man but still winning golds. If at all, the issue is with PSC and POC because they were not able to do grass root development programs to discover new talents. They could not even harmonize the different NSA's(National Sports Associations), where they themselves are quarreling and feuding, non stop, for power for sure, to the detriment of Philippine sports. Swimming, Karatedo, Athletics(PATAFA),Equestrian,Cycling, Badminton,Basketball,Canoe-Kayak and Dragon Boat, etc. Come on, give Philippine Sports a break.